Once there was a village called Shillingford, which was a very ordinary place until it acquired a dragon. The dragon arrived out of a clear blue sky. It scorched across the wheatfields, plummeted down into the orchard, and grabbed a pig rooting under the apple trees. Then it hurtled up with a thunderclap of wings. It left behind a thick trail of smoke and several hundred baked apples, gently swinging from the blackened branches. The dragon sat on the church steeple, tearing the pig apart. The townspeople crept out to look, and shuddered at the sight. The dragon was as red as blood. Every time it took a mouthful of pig, the townspeople had a clear view of three rows of vicious yellow teeth. The Mayor got pushed to the front of the crowd, since dealing with dragons was one of his Mayoral duties. This was the first time he had had to carry it out. The dragon curled its tail around the steeple and stared down with unblinking eyes. Since it made no reply, the Mayor tried again. The crowd shivered and groaned. 'No, we won't,' objected Mrs Honey from the sweet shop. Lazily the dragon stretched out its wings, which were as wide as the church roof. The dragon folded its wings and closed its eyes. Soon it was snoring loudly, wisps of smoke coiling from each nostril. It was hard to be sure if it was really asleep or not. 'What for?' objected Mrs Honey. 'You want to get rid of this dragon, don't you?' said the Mayor impatiently. 'You're not paying some fancy-pants knight all our money!' she objected. 'We haven't got a daughter,' his wife pointed out snappily. 'I'll advertise in the Shillingford Gazette,' the Mayor promised. However, it was two weeks before anyone answered his advertisement. By then the town had no pigs left, and hardly any sheep. The dragon had burnt down all the barns and stables, and those people who still possessed uneaten horses were keeping them in their kitchens. This was not a very satisfactory arrangement. 'Sir Percivayle,' replied the knight mournfully. He was tall, gaunt and pale, with watery eyes, and wore a badly-fitting suit of ancient chain mail. 'You're an experienced knight?' asked the mayor doubtfully. 'Slain any dragons?' inquired the Mayor. 'The Black Knight, eh?' said the Mayor, very impressed. 'Its name is Duarfasti. It was forged by fairy folk in the endless depths of time,' whispered Sir Percivayle. 'Albert-' whispered his wife, as the knight bowed in agreement. Next day, Sir Percivayle set out to meet the dragon. Sanguin, having just finished off the last and toughest goat, was hunting through the town for food. The townspeople had locked themselves in their houses. When Sir Percivayle arrived, the streets were deserted but for the dragon which was busy raiding the butcher's shop. It sprawled on the pavement, gobbling lamb chops. Sir Percivayle drew his famous sword. 'Begone, vile serpent!' he cried in his thin, quavery voice. The dragon turned its back on him disdainfully. Sanguin ignored him and went to work on a rib of beef. The dragon belched, and flicked its tail. It knocked the sword right out of Sir Percivayle's hand and sent him tumbling over backwards. He scrambled to his feet and looked round for his sword. With horror, he saw a hundred metal fragments littering the street. 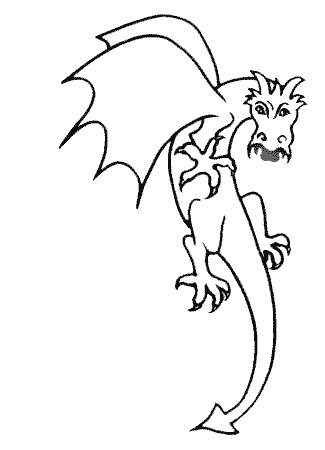 The dragon began to stalk towards him, swaying from side to side. Sanguin's vast jaws opened wide. As Sir Percivayle took to his heels, he heard the clash of giant teeth behind him, and the dragon's raucous laughter. 'I hope this knight's better than the last one,' the Mayor's wife said acidly. 'Indeed!' The Mayor eyed him hopefully. Sir Agravayne had hair as yellow as a lion's mane, though somewhat glossier, and a florid, handsome face. What really caught the Mayor's eye, though, was his dazzling suit of armour. It was pure gold, engraved with a thousand tiny twirls and careful curlicues. So fine and flashing was it that it took the Mayor's breath away. 'Wonderful, wonderful!' said the Mayor. By now, the dragon Sanguin had finished with the butcher's shop and was half way through the baker's. The road was strewn with doughnuts; fruit cake was trampled into the cobblestones. Sir Agravayne picked his way carefully through the crumbs. The dragon clambered over the counter. It looked decidedly angry. Sir Agravayne took a hasty step back and trod on a Swiss roll. 'Have you brought me meat?' roared Sanguin. Flames scorched the doorframe. 'Now look here, this has got to stop,' said Sir Agravayne. He clanged his golden visor shut and tried to hoist his lance. It was too heavy and fell on his foot. He gripped his jewelled mace instead. 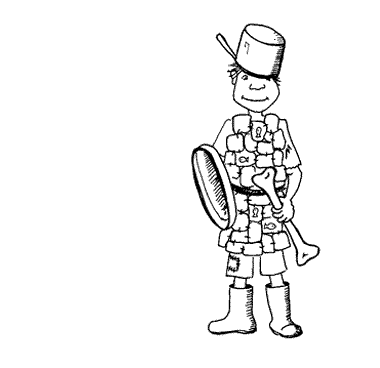 His new armour was guaranteed fireproof and biteproof, a fact which gave him courage. 'It's about time you jolly well shoved off, you know,' he declared hollowly into his visor. Then he gulped, as the dragon opened its mouth wide. There was a deep rumble. Black smoke filled the cavernous mouth. Sanguin huffed. Inky smoke billowed out, completely covering Sir Agravayne. Coughing and choking, he flapped his hands until the cloud disappeared. 'By Jove -' he began indignantly, and then stopped dead as he spotted his reflection in the bakery window. His heart stood still. His beautiful armour was coated in soot. He was no longer gleaming gold. Instead, he looked as if he was carved out of coal. Sir Agravayne dropped his cudgel onto an iced bun and burst into tears. There was a rap at the door. The Mayor's wife opened it and looked down. Her eyes widened. 'Excuse me,' said the small figure in the doorway, as it clanked around her into the kitchen. 'What are you doing here, boy?' demanded the Mayor. 'It looks like a mutton bone,' said his wife suspiciously. Sir Egg walked through Shillingford looking for the dragon. He passed the butcher's and the baker's, and paused at the greengrocer's. A trickle of smoke rolled through the door, followed by four apples and a melon. The dragon appeared in the window. It looked extremely cross. 'Revolting. I hate greens too,' agreed Sir Egg. The red eyes glinted. The dragon came slithering out of the shop, scales grating on the pavement. 'And just who do you think you are?' it rasped. And suddenly the dragon spread its wings and leapt upon Sir Egg, bowling him over. The mutton bone was flung from his grasp. Dozens of huge teeth clashed around his armour. Sir Egg could not shout: the breath was squeezed out of him. He was lifted into the air, shaken like a rag on a clothes line and finally hurled down upon the pavement where he landed in a painful clatter of sardine tins. It snarled, baring its triple rows of teeth. Long red flames poured from its mouth. Sir Egg, staggering, held out his dustbin lid. A blast of searing air scorched past him, frizzling his hair. There was a terrible smell of burning rubber. 'Phew! What a stink!' exclaimed the dragon in disgust. It began to lollop heavily away down the street. Picking up his mutton bone, Sir Egg ran in pursuit. The dragon turned, ready to fry him. Then its eyes fixed on the bone. Its nostrils twitched. 'What have you got there?' it rumbled. 'It's a very famous mutton bone,' panted Sir Egg. 'I'll tell you, if you promise to go away and leave us alone,' Sir Egg suggested. 'That's right.' Sir Egg did not mention the sweet shop hidden down an alley. 'Here - try the mutton bone!' He tossed the bone to Sanguin, who caught it expertly and crunched it up like a giant biscuit. Two gulps later, it was gone. 'What's that?' asked Sir Egg. The dragon scratched its ear in an embarrassed sort of way. 'But I am!' cried Sir Egg. Sir Egg repeated it, and the dragon rolled the name around its tongue. 'Certainly,' said Sir Egg politely. Sir Egg whispered in its ear, and the dragon launched itself up into the air. High over the rooftops it braked, turned a somersault and hurtled back downwards. Sir Egg wondered if it had changed its mind. Arching its neck, it roared a devastating spout of flame straight at the fish shop. The door burst into flames. Fillets of cod curled up and turned black on their slabs. 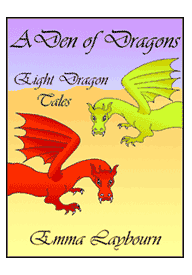 'Can't stand fish,' growled the dragon, as with huge, heavy wingbeats it flapped away. The Mayor didn't argue. He had enough problems, what with the townspeople demanding their money back with interest, and a horse that refused to move out of the kitchen. Mrs Honey from the sweet-shop didn't argue either. She was so grateful to Sir Egg for saving her shop from being caramelised that she offered him lodgings and all the toffee he could eat. So Sir Egg lived happily over the sweet-shop, learning to make humbugs and gobstoppers and being much fussed over by the old lady. Although she was not quite so sweet as her name, she was as nice as lemon pie to Sir Egg. She even offered to adopt him. So, to his delight, Sir Egg became Egg Honey. He sincerely hoped that he would never again have to reveal his ridiculous old name to anyone.